Marsha I love that red Cardinal in the black and white scene! Such an elegant design. What wonderful projects Marsha. You've really showcased some great stamps and products. I absolutely love your final card. The tag and poinsettia are so beautiful and I love that dsp in the background. Thanks for sharing! Thank you, Penny! It turned out better than I expected. I did make several changes and had to keep taking it's picture and changing it in the post. LOL I finally said this is it! Thanks, Jean! As you know the process was interesting. All I can say is, it was a day. Marsha, I really love Happy Scenes card. One of my favorite sets in the Holiday Catalog. Your poinsettia card is wonderful. Thanks, Marie! It is becoming a favorite and I'm sure I'll use it many times. It is so versatile. I really like all of your projects. The poinsettia is really pretty. I am a huge fan of black and white so your Happy Scenes card is my favorite. Thanks, Christine! I love black and white and think it makes for an elegant combination. I had seen a cardinal out my window and thought a spot of red on the card would be just the thing. Love the wreath and scene card. 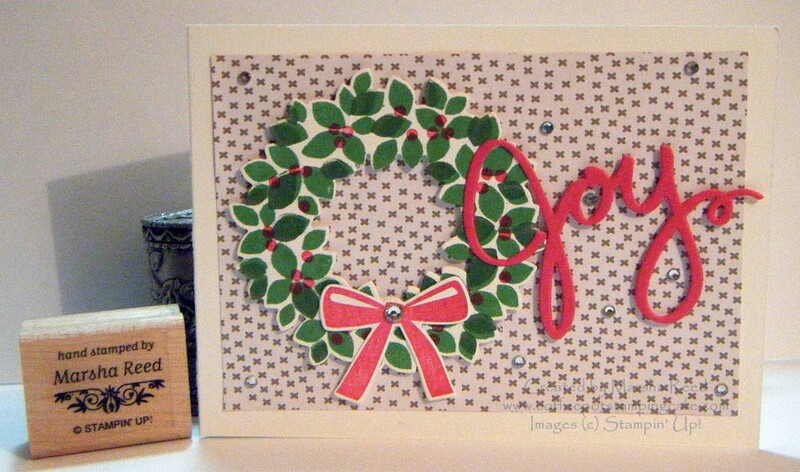 Your poinsettia card has a wonderful selection of colours. Beautiful! 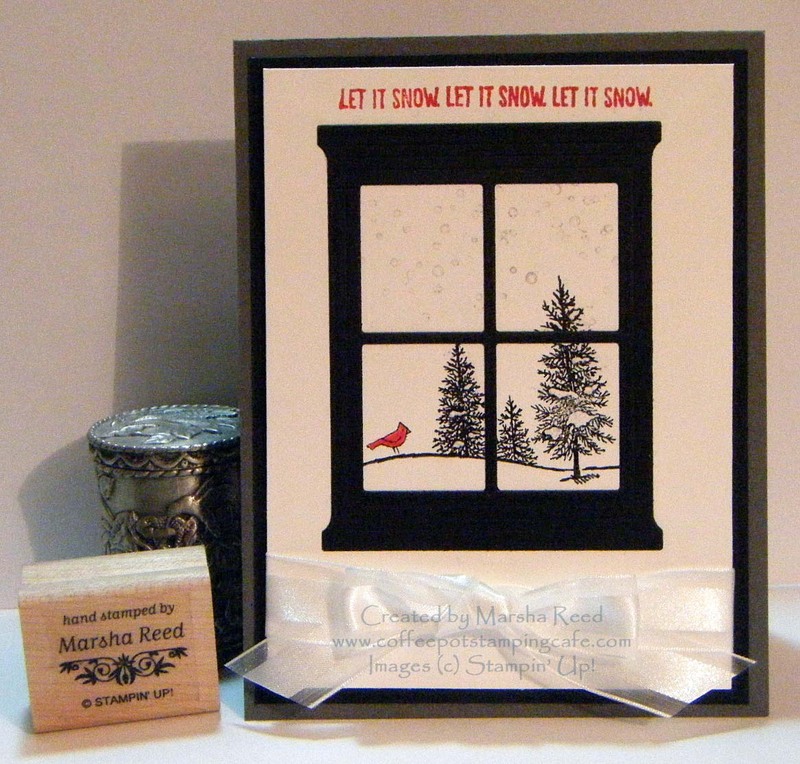 It was totally worth waiting for, Marsha - your poinsettia card is beautiful! Of course, so are the first two! Thanks, Kathe! 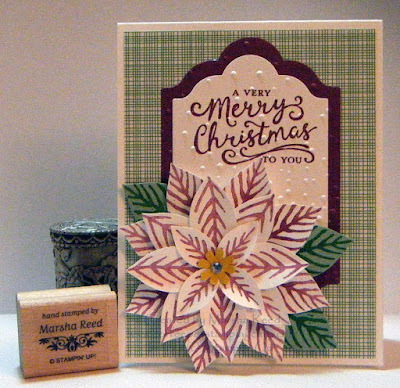 I think the Reason for the Season stamp set and Festive Flower Builder Punch are going to be favorites of mine for this Christmas season. Marsha, I love your poinsettia card!! I wouldn't have ever thought to make one with white leaves, but I love it! Great cards! Hi Marsha, thanks so much for continuing to be part of this terrific blog hop. 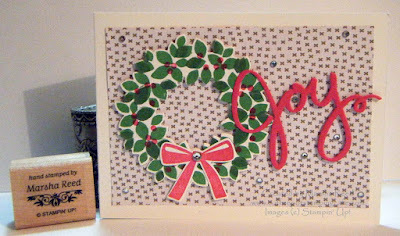 Very Vanilla or Whisper White, that wondrous wreath card is a winner. I agree with you about enjoying the scenes one can make through that window framelit. Your outdoor scene is just perfect. Love the little cardinal! I've just ordered the Reason for the Season bundle and your card makes me glad I did. I love the 3-D effect of that wonderful poinsettia. Keeping it white with red veining was brilliant. Lovely cards, but I like the Joy card best. Just a nice layout for those two images. Thanks, Jackie! It was a fun card to put together. Black & white with a pop of red-perfect.